VATICAN CITY (Reuters) - Pope Francis promised that concrete action against child sexual abuse by priests would result from a conference he opened on Thursday, with one cardinal acknowledging that the Church had to fight "the enemy within". Francis convened Catholic leaders from around the world for the four-day meeting to address the scandal that has ravaged the Church's credibility in the United States - where it has paid billions of dollars in settlements - Ireland, Chile, Australia, and elsewhere over the last three decades. His opening remarks appeared aimed at countering scepticism among victims who said the meeting looked like a public relations exercise. "Faced with the scourge of sexual abuse committed by men of the Church against minors, I wanted to reach out to you," Francis told the assembled bishops and heads of religious orders. He asked them to "listen to the cry of the little ones who are seeking justice". 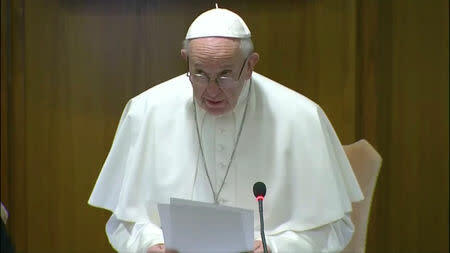 Francis, opening the conference of nearly 200 participants in a Vatican auditorium, added that victims deserve "concrete and efficient measures" and not mere condemnations. Victims were mixed in their response, with some expressing cautious optimism and others saying it was too little, too late. Cardinal Rubén Salazar Gómez of Bogota said the damage was home-grown, in large part because bishops had closeted themselves in a clerical mentality and some thought they could act with impunity. "The first enemies are within us, among us bishops and priests and consecrated persons who have not lived up to our vocation. We have to recognize that the enemy is within," he said. The pope and the participants watched a video of five victims, most of whom wished to remain anonymous, telling painful stories of abuse and cover-up. "From the age of 15 I had sexual relations with a priest. This lasted for 13 years. I got pregnant three times and he made me have an abortion three times, quite simply because he did not want to use condoms or contraceptives," a woman said. Juan Carlos Cruz, a Chilean, said on the video that when he reported abuse to religious authorities he was treated as a liar and an enemy of the Church. "You are the physicians of the soul and yet, with rare exceptions, you have been transformed - in some cases - into murderers of the soul, into murderers of the faith. What a terrible contradiction," he said. Cardinal Luis Tagle of the Philippines broke into tears as he read a keynote speech that acknowledged: "Wounds have been inflicted by us, the bishops, on the victims". A list of 21 "reflection points" written by the pope was handed out. The first was that each diocese should have a "practical handbook" on steps to be taken when cases emerge. They included actions such as informing civil authorities of substantial accusations in compliance with local law and making sure non-clerics are involved in Church investigations of abuse. "Putting together a handbook after all this time is laughable," said Peter Isely, who was abused by a priest as a boy and now heads the advocacy group Ending Clergy Abuse. Most of the 21 points are already practiced in countries like the United States. In Ireland, the sexual abuse scandal shattered the power of the Church which four decades ago dominated society. In the past four years, voters approved abortion and gay marriage, defying the Vatican. In Chile, all of the country's bishops offered their resignations to the pope last year over a widespread cover-up. Francis accepted seven of the resignations and dismissed two others from the priesthood. A report by a grand jury in Pennsylvania last year revealed that priests had sexually abused about 1,000 people over seven decades in that U.S. state alone. Before the conference started, some victims' groups said the event was an attempt to cleanse the image of the 1.3 billion-member Church. But Anne Barrett-Doyle of bishopaccountablity.org, which tracks abuse cases around the world, said she was pleasantly surprised by the pope's opening remarks. "They said this was going to just be a teaching session, but he is now talking about concrete measures. That's good, but let's see how it ends up," she told Reuters.